Original article can be seen here. Translated article below. 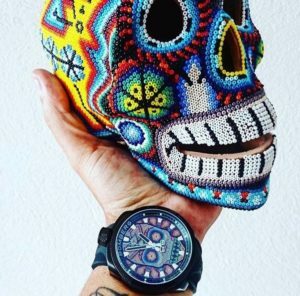 The Mexican division of Bomberg, Rick De La Croix’s brand of luxury watches, presented on November 2nd the launching of a new watch in its Skull series whose design is inspired by the colorful Huichol crafts of Mexico characterized by their use of beads. “Our new Skull Pearl honors the elegant Huichol art by commemorating the oldest tradition: The day of the dead” confirmed the Mexican division of the brand through social media. The 44mm Bolt-68 Quartz Skull Pearl comes with a black strap and dial that displays a skull made of small beads available in black and white, red, black and white, and the characteristic Huichol multicolored design. Every watch in the collection comes registered with a serial number and engraved with the buyer’s name. This special edition piece has already been released exclusively by official brand distributors in the Mexican capital with a price of 18,900 pesos and limited to just 22 pieces. Executive President De la Croix also stated that sales will support the reconstruction of homes damaged by the earthquake that shook Mexico City last September. First launched to the market in 2012 by Rick de la Croix, present CEO and founder of the brand, Bomberg has a presence in more than 20 countries in Europe, the Middle East, Asia, and Latin America. In Mexico it has over 20 official distributors and is also sold by the department stores El Palacio de Hierro and Liverpool.